2018 is quickly coming to an end, but what a year! For GrowthWheel South Africa 2018 has been a very special year that we couldn’t have anticipated. 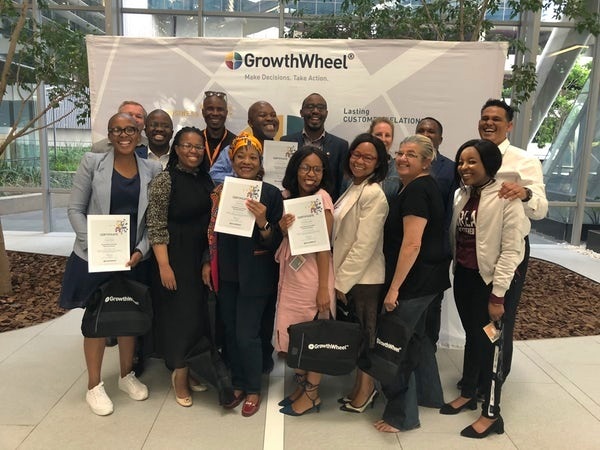 We have run 8 Certification Courses hosted by Alexander Forbes and with the Brian Simelane as instructor and welcomed more than 60 new GrowthWheel Certified Business Advisors. It’s been 6 years since the first business advisors from the South African entrepreneurship development support eco-system were certified. Today, more than 250 business development service organizations, accelerators, and incubators use GrowthWheel to create jobs and help small businesses grow. This year, we have also participated in several key conferences, roundtables, international study trips, pitch competitions, award ceremonies and hundreds of meetings. Our masterClass at the AfriLabs Annual Gathering was an epic milestone, and it was a huge privilege to be part of the African community. We could have not anticipated that after the South African Business Conference 2018 we finally would sign a landmark agreement with The Institute of Business Advisors Southern Africa (IBASA) that aims to enable over 2000 business advisors to enhance their impact with the GrowthWheel Framework and cloud platform. Or that we would collaboratively join Small Enterprise Development Agency (SEDA) and the YES initiative that was launched by President Cyril Ramaphosa in 2018 to help SMMEs throughout South Africa to create sustainable jobs. Also, we would not have anticipated that in 2019 the Seda Incubation eco-system might turn out to be completely paperless due to our co-creation partnership with SEDA and Incubation Partners. We are looking forward to what the new year will bring, continue to strengthen and grow our collective impact, partnerships with our stakeholders, empower the business advisors and incubators to support the ecosystem in South Africa.